The 2018-19 season marks Music Director Carl St.Clair’s 29th year leading Pacific Symphony. 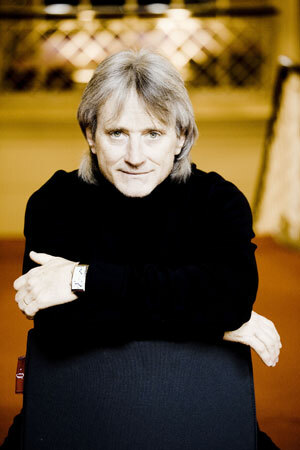 He is one of the longest‑tenured conductors of the major American orchestras. St.Clair’s lengthy history solidifies the strong relationship he has forged with the musicians and the community. His continuing role also lends stability to the organization and continuity to his vision for the Symphony’s future. Few orchestras can claim such rapid artistic development as Pacific Symphony—the largest orchestra formed in the United States in the last 50 years—due in large part to St.Clair’s leadership. During his tenure, St.Clair has become widely recognized for his musically distinguished performances, his commitment to building outstanding educational programs and his innovative approaches to programming. In April 2018, St.Clair led Pacific Symphony in its Carnegie Hall debut, as the finale to the Hall’s yearlong celebration of pre‑eminent composer Philip Glass’ 80th birthday. He led Pacific Symphony on its first tour to China in May 2018, the orchestra’s first international tour since touring Europe in 2006. The orchestra made its national PBS debut in June 2018 on Great Performances with Peter Boyer’s Ellis Island: The Dream of America, conducted by St.Clair. Among St.Clair’s many creative endeavors are the highly acclaimed American Composers Festival, which began in 2010; and the opera initiative, “Symphonic Voices,” which continues for the eighth season in 2018‑19 with Puccini’s Madame Butterfly, following the concert‑opera productions of The Magic Flute, Aida, Turandot, Carmen, La Traviata, Tosca and La Bohème in previous seasons. St.Clair’s commitment to the development and performance of new works by composers is evident in the wealth of commissions and recordings by the Symphony. The 2016‑17 season featured commissions by pianist/composer Conrad Tao and composer‑in‑residence Narong Prangcharoen, a follow‑up to the recent slate of recordings of works commissioned and performed by the Symphony in recent years. These include William Bolcom’s Songs of Lorca and Prometheus (2015‑16), Elliot Goldenthal’s Symphony in G‑sharp Minor (2014‑15), Richard Danielpour’s Toward a Season of Peace (2013‑14), Philip Glass’ The Passion of Ramakrishna (2012‑13), and Michael Daugherty’s Mount Rushmore and The Gospel According to Sister Aimee (2012‑13). St.Clair has led the orchestra in other critically acclaimed albums including two piano concertos of Lukas Foss; Danielpour’s An American Requiem and Goldenthal’s Fire Water Paper: A Vietnam Oratorio with cellist Yo‑Yo Ma. Other commissioned composers include James Newton Howard, Zhou Long, Tobias Picker, Frank Ticheli, Chen Yi, Curt Cacioppo, Stephen Scott, Jim Self (Pacific Symphony’s principal tubist) and Christopher Theofanidis. In 2006‑07, St.Clair led the orchestra’s historic move into its home in the Renée and Henry Segerstrom Concert Hall at Segerstrom Center for the Arts. The move came on the heels of the landmark 2005‑06 season that included St.Clair leading the Symphony on its first European tour—nine cities in three countries playing before capacity houses and receiving extraordinary responses and reviews. From 2008‑10, St.Clair was general music director for the Komische Opera in Berlin, where he led successful new productions such as La Traviata (directed by Hans Neuenfels). He also served as general music director and chief conductor of the German National Theater and Staatskapelle (GNTS) in Weimar, Germany, where he led Wagner’s Ring Cycle to critical acclaim. He was the first non‑European to hold his position at the GNTS; the role also gave him the distinction of simultaneously leading one of the newest orchestras in America and one of the oldest in Europe. In 2014, St.Clair became the music director of the National Symphony Orchestra in Costa Rica. His international career also has him conducting abroad several months a year, and he has appeared with orchestras throughout the world. He was the principal guest conductor of the Radio Sinfonieorchester Stuttgart from 1998‑2004, where he completed a three‑year recording project of the Villa–Lobos symphonies. He has also appeared with orchestras in Israel, Hong Kong, Japan, Australia, New Zealand and South America, and summer festivals worldwide. In North America, St.Clair has led the Boston Symphony Orchestra (where he served as assistant conductor for several years), New York Philharmonic, Philadelphia Orchestra, Los Angeles Philharmonic and the San Francisco, Seattle, Detroit, Atlanta, Houston, Indianapolis, Montreal, Toronto and Vancouver symphonies, among many. A strong advocate of music education for all ages, St.Clair has been essential to the creation and implementation of the Symphony’s education and community engagement programs including Pacific Symphony Youth Ensembles, Heartstrings, Sunday Matinées , OC Can You Play With Us?, arts‑X‑press and Class Act.